to poison earth and air and crystal spring? Be to the living and the coming just. Is cremation's pious task complete. Be waft as on the golden wings of flame. Doth best become the cultured state of man. The lone chaste remnant of life's human part. The first crematory in the state of Arkansas was opened in 1974 in Conway. Located in Crestlawn Memorial Park, it was installed by Denver Roller, a leading funeral director in the state during his time. The original building stood until 2001 when it was destroyed by a fire. A new metal building and Matthews cremation equipment stand where the old building was. 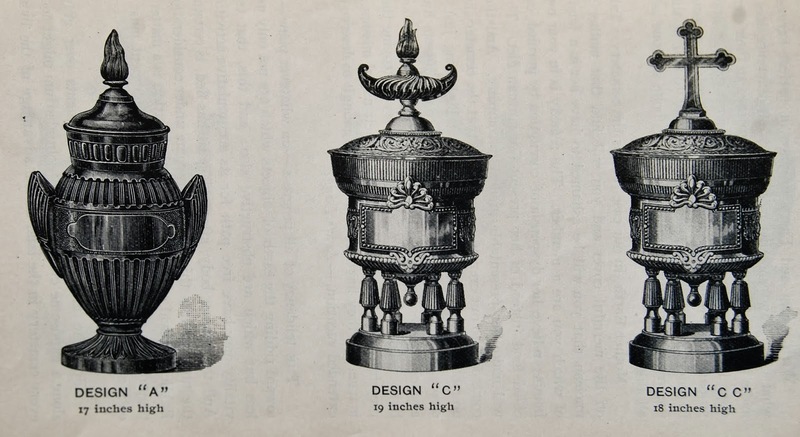 Throwback Thursday: "Modern Cinerary Urns"
"Modern Cremation Urns" as seen in the Fresh Pond Crematory, Long Island, New York, in 1896. 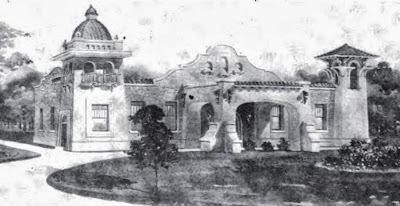 The first crematory built in the state of Texas was located in San Antonio and was built by the San Antonio Cremation Company. The general location was east of the historic cemeteries at the corner of East Crockett & North Palmetto Streets. The building was constructed after 1885, but before it could be used it was destroyed by arson. I have been unable to find a photograph or rendering of the building. In 1922, Mission Burial Park constructed a chapel on their grounds that contained a crematory, and this became the state's first operational crematory. The facility still stands, though cremation operations have been moved to another part of the cemetery. 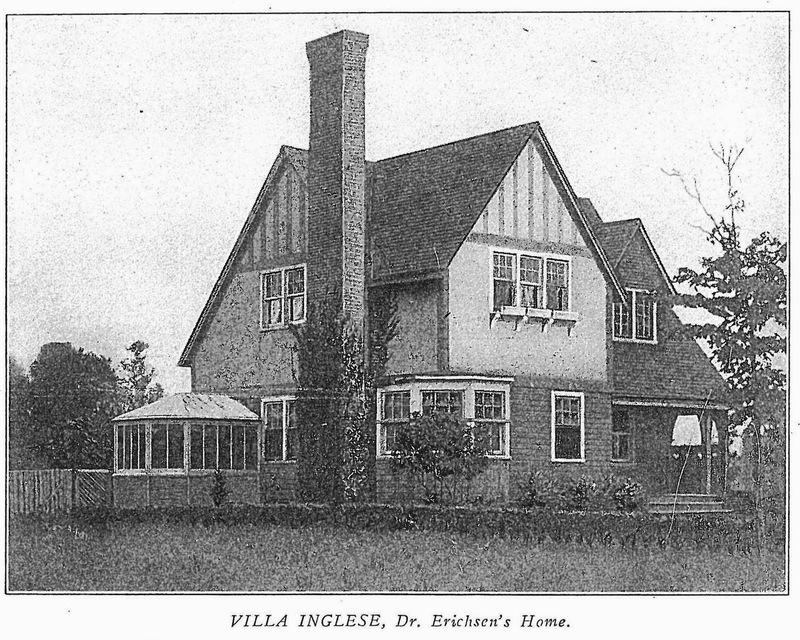 The building is pictured below as illustrated in an issue of Park & Cemetery (Modern Cemetery) Magazine in 1922. 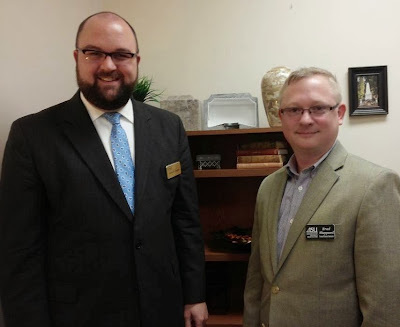 I was honored to speak with the future of our profession in the Funeral Science Department of Arkansas State University Mountain Home at their Northwest Arkansas Community College Campus yesterday. Their instructor, Bradley Sheppard, invited me to give a presentation about cremation arrangements. While there, I presented the class with their own sampling of MacKenzie cultured marble urns courtesy of Scott MacKenzie of MacKenzie Vault in East Longmeadow, Massachusetts. campus. The MacKenzie urns are behind us on the top shelf. This address was delivered at the 1976 CANA Convention in Pittsburgh and was printed in the Cremationist, Summer, 1976. Cliff's grandfather, Clifford Zell, Sr., was an integral member of the Cremation Association and was responsible for much of the cremation movement in the midwestern US. 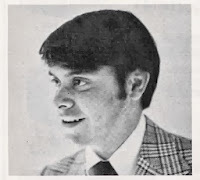 Cliff's father Clifford, Jr, was also active in the Association, and his mother, Genevieve "Ginger" Zell, was the Association's first female president. I prefer cremation because it offers me a choice, not available in other types of burial. I see the chance and the duty to control the condition of my burial. But most important, this becomes a matter of my choosing, not leaving it up to nature. Oh yes, nature has a plan for us. I know that at the instant of death, a “natural biological process” begins: dehydration; and that if I do nothing to prevent it, this process will control perhaps the next several hundred years of burial. But isn’t it fascinating how we control nature today? 1) We seek shelter and clothe ourselves for protection from her violent extremes. 2) We harness her elements to our own benefit. 3) With modern technology we even control our environment. I heard someone say that it’s not nice to fool Mother Nature… but if I see a chance to speed up her work and to bring about a desired end, then I see reason to do so, and I will do so. Let’s talk plainly about life. Life is, for many, a journey made in the fellowship of two separate entities, the body and the soul. Yet in death the body is fallen. It requires at this time very special attention, attention that was easy to offer in life but now the task becomes ever so much more demanding. We must, I feel, take positive and affirmative action to safeguard it from neglect or abuse. But what of the soul? Does it continue on? Of course, for the journey continues as life’s own significance is expressed in memories and memorialization. Cremation is the very kindest action a survivor can do for their loved one. For me the journey is not over at death if I know that this process will continue in the grave. My true destination in life is to be brought to the point where my body will no longer be affected by the element of nature. Cremation becomes my duty; my only means to fulfill the journey near the time of death. Certainly cremation offers wisdom to me and, incidentally, to about 800 of my young friends. You see, it is my duty to conduct seminars as part of the curriculum of several area colleges… courses in death and dying, also funeral service education. So it is my job to introduce to them and examine with them cremation. And what do we find? We find the inherent wisdom of cremation speaks very plainly to us and as I speak plainly with them – facts without the romance – bottom line and from the hip. We see several kinds of wisdom. Wisdom in utility: knowing that only a given amount of space is required for the inurnment of our cremated remains, we must use this much and no more. Nothing wasted here. Wisdom in cost: because in many cases the cost of total cremation arrangement is less expensive than ground burial, therefore making the difference available to benefit the survivors. And finally, we see something that is the opposite of wisdom: foolishness. We see that it is foolish to think the body can be preserved. The most elaborate burial vault, the most extensive embalming does not preserve. And what if it could? What condition is the body in at death? Many times death takes place after an extended illness which has taken its toll in appearance, violent death has disfigured. We often cannot control the cleanliness of the area where death happens. Hospitals or nursing homes not as clean as our homes. The body is a bacterial junkyard. Then, if preservation were available, would this be the way we would want to perpetuate it? No sir, it doesn’t make sense to us. What does make sense to me is a pattern in life: a sequence of logical decisions that leads to purposeful cremation. This has to do with our ideas of change. You know that in young life, we welcome and anticipate active change, change that brings a new and better situation to our lives. Also, we look forward to a kind of physical change which is a wonderful and beautiful thing. But later in life, our perspectives change. The seventh inning stretch reminds us we’ve grown weary of active change. We feel fulfillment of life is to settle down. Maybe retire. We safeguard ourselves from drastic change in income with pension and annuities. Our health is stabilized with special care and medicine. We even go to the length of prearrangement to make the inevitable and necessary transition into death a smooth and orderly affair. We seek a kind of peace with the universe – devoid of interference from undue influence – knowing we’ve deserved undisturbed rest truly. I cannot imagine peace in the grave, knowing a process goes on and on, beyond my control. So I say “Deliver me to the point where my body will no longer be the victim of time,” and with me now my most primary element of composition, my cremated remains, perhaps that which is truly me, at rest in a memorial of bronze, that will, as I am no longer able to, carry on my identity. 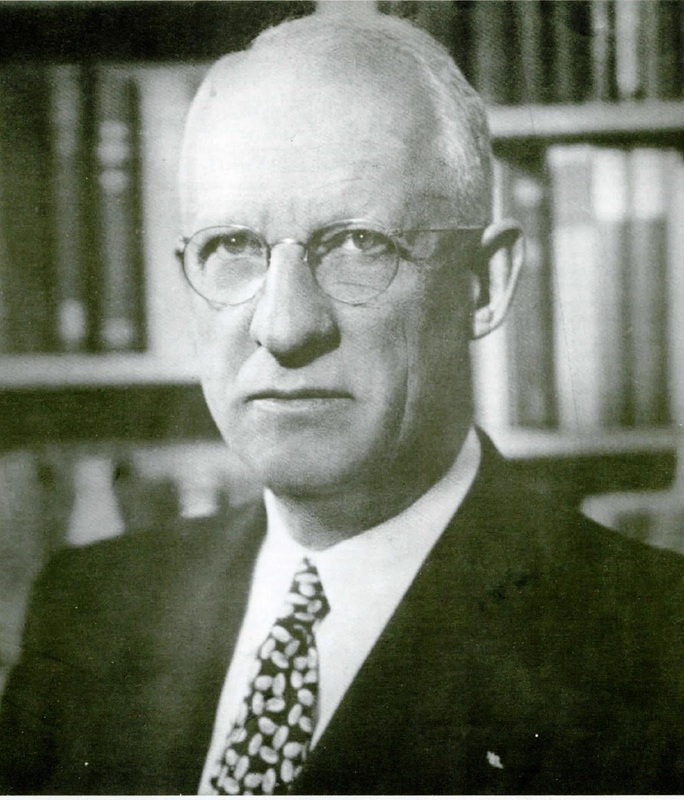 In addition to being the founder of the Cremation Association of America, and history’s most ardent supporter of cremation, Hugo Erichsen was also a neurologist. He was the author of several nationally published books on various subjects in English and German, he contributed to countless magazines and journals, was a photographer, and a master gardener. 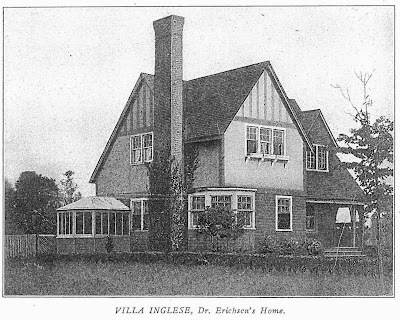 His estate in Birmingham, Michigan, the Villa Inglese, was a featured residence in the area and was known for its beautiful gardens. A lifelong Cremationist in heart and soul, Hugo Erichsen fulfilled his advocacy and belief in Cremation upon his death on October 10, 1944. His remains were cremated on October 14, 1944, following funeral services in the Woodmere-Detroit Crematorium and his cremated remains were inurned in the Chapel Columbarium. For more information on the good doctor, see my post from February, 2013. 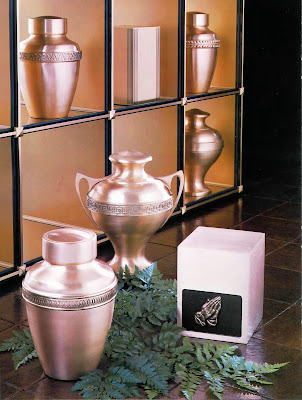 A collection of Matthews spun and sheet bronze "income producing" cremation urns, circa 1982. 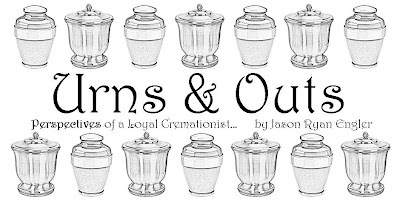 This is the new site for Urns & Outs!!! Be sure to update your bookmarks! It was a cold and rainy December day in 1876 when the Cremation movement in America made a major step forward. In the small town of Washington, Pennsylvania, Dr. Francis Julius LeMoyne, a local eccentric physician, had built small, simple two-room building with a receiving room, a furnace room which contained a crematory, designed by a local engineer. Planned exclusively for use at his own demise, the facility was constructed on his private property after the local cemetery had declined use of their grounds. 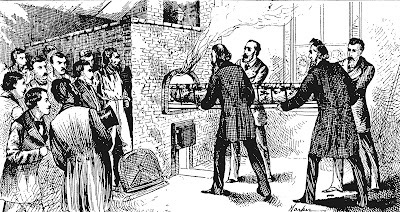 The Crematory, however, could not remain idle, as it was pushed into use by Henry Steel Olcott for the Cremation of one of his followers, Bavarian immigrant Baron Joseph DePalm. Once upon a time, in fact it was December 5, 1876, in Washington, Pennsylvania, the body of the Baron de Palm arrived at the train station there to be the first to be cremated in a modern cremation chamber. Among the party that met the train included Dr. Francis Julius LeMoyne, whose crematory was to be used, and Col. Henry Steel Olcott, founder of the Theosophical Society and executor of the Baron’s estate. The cremation was a newsworthy event that was covered in almost every major newspaper in the country. On their way to the crematory, they were met by doctors of the boards of health from Brooklyn, Pittsburgh, Wheeling, W.Va., and Boston – along with about 30 reporters from various news outlets. This first cremation in a modern cremation chamber took 36 hours to complete: 6 hours to preheat, 6 hours to cremate, and 24 hours to cool. Coke was used as fuel and 50 bushels were consumed. The total process cost $7.04. The LeMoyne Crematory held the distinction of being the only Crematory in the country from its inception until 1884. 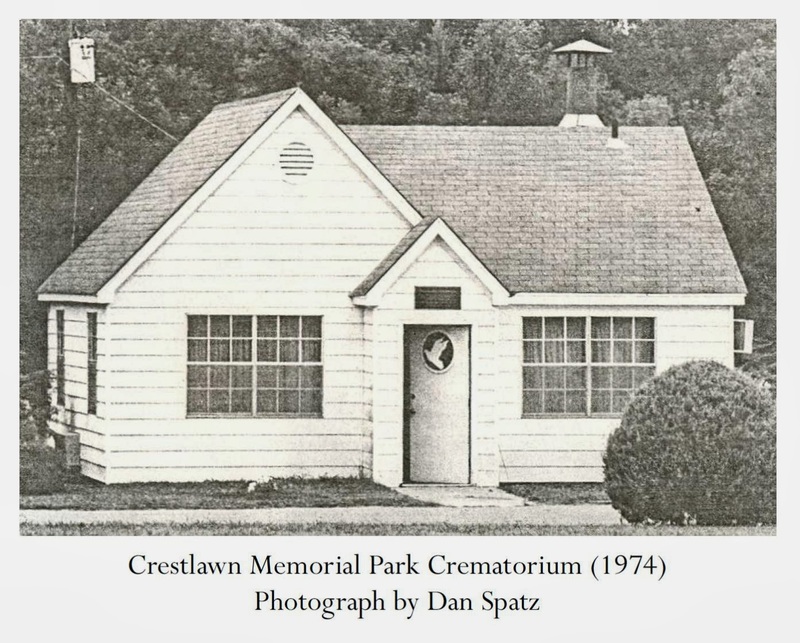 At that time, after twenty-five Cremations had been performed in the facility – one of which was that of Dr. LeMoyne himself, the crematory was closed to the public with the exception of residents of Washington County. In 1901, with the cremation movement in full-swing, the trustees of the crematory closed its doors for good after 42 cremations. It was later deeded to the Washington County Historical Society, in whose care it remains to this day. Lawrence F. Moore, pictured above, was the long-time president and operator of the Chapel of the Chimes in California and was the most adamant cremationist of his time. 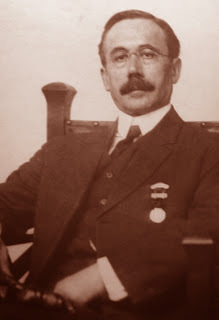 He was the most instrumental character in the cremation world and held the accomplishment of coining the word “inurnment.” Additionally, he invented the first electric-powered cremator, and a unique metallic disc used in every cremation to identify cremated remains. He also was the first to suggest using a cardboard temporary urn to encourage the selection of a permanent urn. His facility, the California Crematorium (now known as Chapel of the Chimes) in Oakland, California, is inarguably the most successful crematory and columbarium in the country. 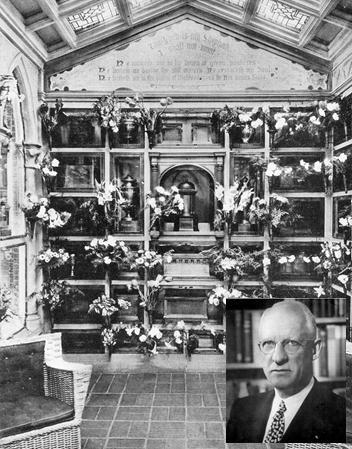 From 1911 to 1934, the California Crematorium had conducted 23,732 cremations, 53% of which were placed in bronze urns and inurned in the columbarium. One of the most well-known and documented examples of cremation in ancient times is the cremation of the companion of Achilles – Patroclus. Achilles took Patroclus at a young age as his squire and best friend. Their companionship is legendary and has been the subject of many debates and discussions, and likewise many love stories. The two were dispatched to Troy to defend the honor of Helen, and both would later be killed in battle. During the Trojan war, Achilles became frustrated with the lack of respect he was receiving from his peers, so he refused to fight. His fellow Grecians became forlorn and the battle was decidedly going to be lost to Troy. To renew the spirit of the Grecian Army, Patroclus volunteered to disguise himself as Achilles to chase the Trojans from the Greek camp, and thus encourage the Grecian soldiers to fight. Patroclus became overzealous and was killed by the spear of Hector, the great general of the Trojan army. Achilles was enraged and stricken with grief. He mourned for 12 days the death of his beloved partner and refused to allow his body to be disposed of – until Patroclus visited him in a dream – begging him to dispose of his body by fire so that his spirit could be freed and he could enter the underworld. “The Myrmidons stayed and built up huge piles of wood and made a pyre of a hundred feet on each side, and with grief in their hearts they placed the body upon it. In front of the pyre, they slaughtered, skinned and dressed many plump sheep and lumbering bulls. And Achilles took the fat from them all and covered Patroclus head to foot and heaped the bodies around him, then put some jars of honey and oil there leaning against the funeral bed, and with groans he slaughtered four horses and threw them onto the pyre. Patroclus had nine pet dogs that he fed at his table, and Achilles took two of them, killed them, and threw their bodies onto the pyre. And with butchery in his heart, he ordered his men to bring the dozen young Trojan [prisoners], and after he killed them, one after the other, he threw them onto the pyre. To this he applied the fire and lit the wood so that the flames would spread and consume it all." Later, Achilles charges the Myrmidons to gather the remains of Patroclus and place them in a golden, two handled urn given by Achilles’ mother, the sea goddess Thetis. Achilles also tells his comrades to place his remains into the same urn upon his death – honoring Patroclus’ wish that they may be one in death as they were in life. This example has set the stage for many of the remembrances we offer our families today. 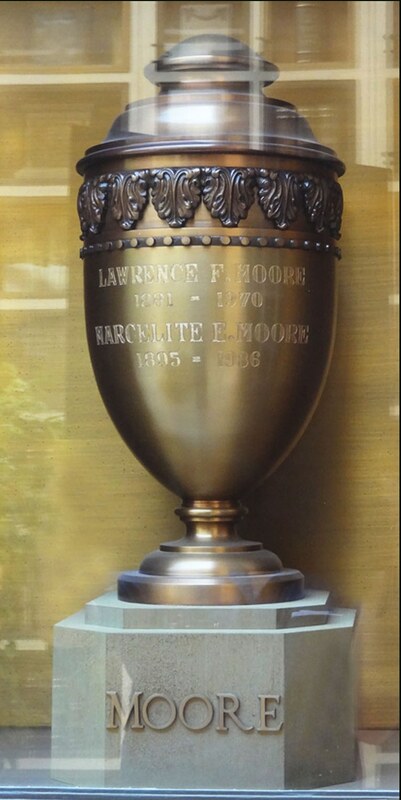 MacKenzie Vault created the world’s first cultured marble urn in 1969. 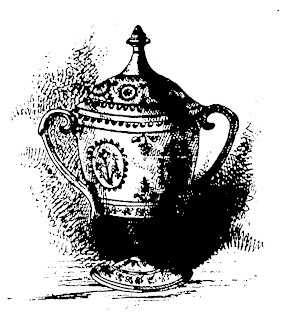 The urn was made by Neil MacKenzie whose son Scott is the president. The first urn, called the “Gothic” is still made as the MacKenzie Classic and is a trademarked shape that many try to duplicate. The memorial idea was started in cemeteries – the establishment of a memorial identity for each person who lived and died was the most important part of the rite of passage called death. Cremationists quickly adopted the idea to include cremation, and the obstacles they faced were harder to overcome than their cemeterian counterparts. A strong cast of characters was necessary to put the idea into practice, and the crematories of the country included some of the most ardent and unique characters that could be found, a couple of the most notable of which were Lawrence Moore (President of the California Crematorium in Oakland which later became the famous Chapel of the Chimes), and Clifford Zell (Owner of the Valhalla Chapel of Memories in St. Louis). Cremation urns have been utilized in one form or fashion since the dawn of civilization. Greeks placed their dead in urns of various materials – the legendary urn that held the cremated remains of Patroclus and Achilles was made of gold – but most were made of terra cotta. The Romans similarly placed their dead in urns of semi-precious stone and the urns were later deposited in columbaria. 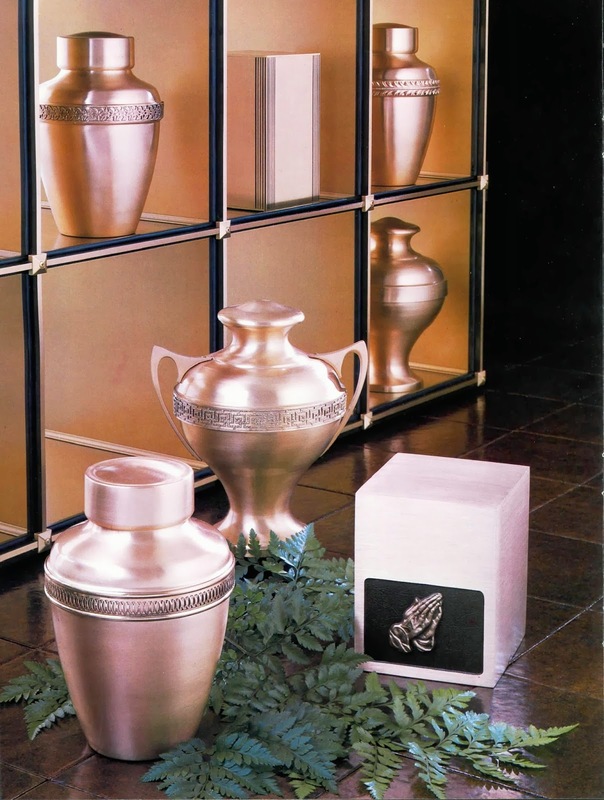 After cremation’s modern revival began, urns still were not uniform in size or composition. 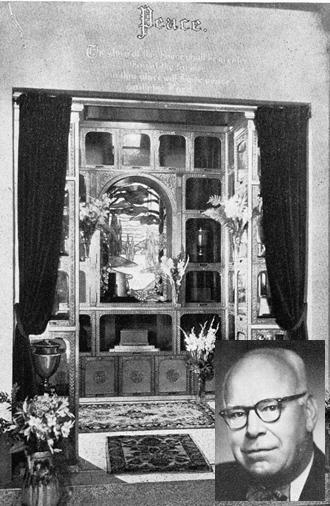 After Baron de Palm’s cremation, his cremated remains were placed in an antique vase with brass handles and a brass nameplate. The urn of writer and speaker Robert Ingersoll, who died in 1899 and was cremated by the US Cremation Company in New York, was made of bronze with a porphyry base – imported from France by the Tiffany Company. In the early 1900s, urns of various metals, including copper and tin, were frequently used – and in the 1920s, bronze urns became the norm. Because bronze is a semi-precious metal, and cast bronze will only patina with age and will not degrade over time, it made the perfect medium to create permanent, imperishable memorials. 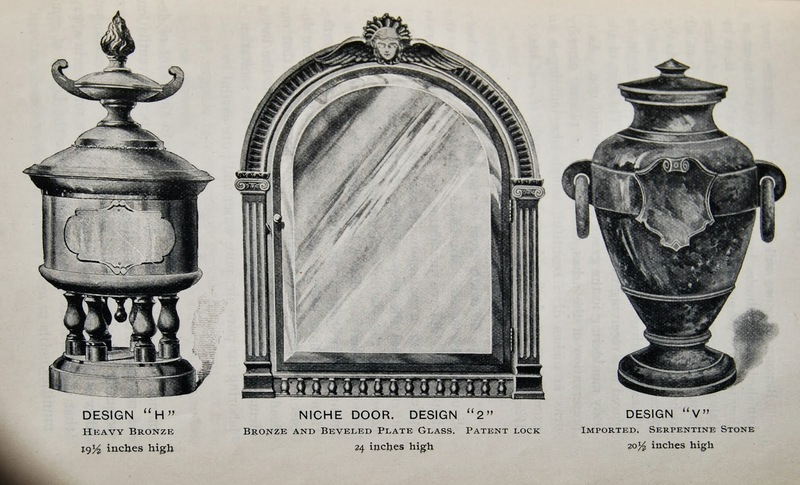 Several companies, over time, created urns of various shapes and sizes – but most had a decorative look to them – for most were placed on display in glass fronted niches. to affect the permanency of the urn memorial. 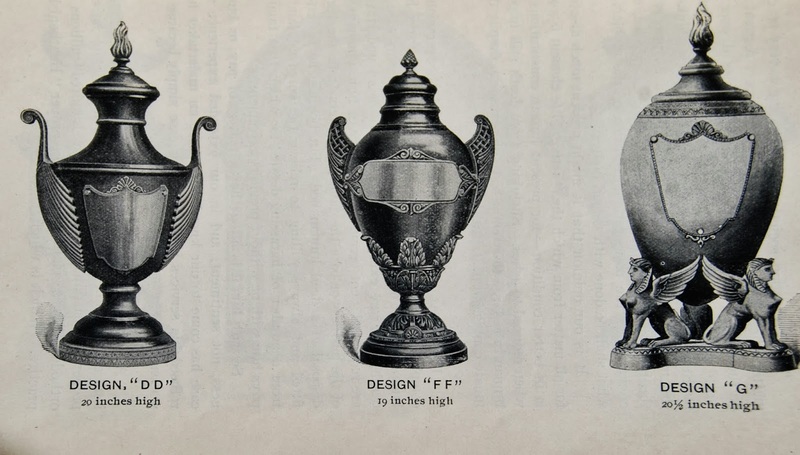 The Rochester Can Company, Oregon Brass Works, Meierjohan-Wengler, and Gorham Bronze were some of the major manufacturers of urns in the US, and it was not uncommon for individuals to request and have specially designed urns created. The first logo of the Cremation Association, though unpublicized, was round with a torch in the middle and was used on the association’s badge. The urn memorial was so important to cremationists that the second and third logos were illustrations of an urn in a niche. Though this quote was shared by Steve around 2004, it was one of the major points of the memorial idea. When a bronze urn was engraved indelibly with a person’s name and dates of birth and death, the urn became part of the memorial. Together with the other urns in a columbarium, they lent their beauty to add to the overall experience of a columbarium. Just as every person who lives must die, so too should every person who dies have a permanent resting place. Just as the ancients inscribed names on the urns of their loved ones, the ancient Greeks erected Tumuli in memory of their dead, just as the Egyptians erected the pyramids, the Romans inurned in columbaria, Kings and Queens are entombed in Westminster Abbey, so the placement of the urn became the permanent memorial that cremationists required. This was the utmost concern of the cremationists who were active in the Cremation Association. The inurnment of cremated remains was not always a priority for cremationists, but became the sole purpose of the plight of the association beginning in the late 1920s. Scattering cremated remains, permanent destruction of cremated remains, and home retention of cremated remains were all in direct conflict with the memorial idea. The conventions of the association were breeding grounds for ideas in furthering the memorial idea to those who chose cremation. Lawrence Moore, was the long-time president and operator of the Chapel of the Chimes in California and was the most adamant cremationist of his time. He was the most instrumental character in the cremation world and held the accomplishment of coining the word “inurnment.” Additionally, he invented the first electric-powered cremator, and a unique metallic disc used in every cremation to identify cremated remains. He also was the first to suggest using a cardboard temporary urn to encourage the selection of a permanent urn. His facility, the California Crematorium (now known as Chapel of the Chimes) in Oakland, California, is inarguably the most successful crematory and columbarium in the country. 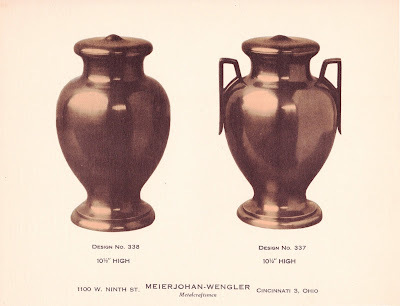 From 1911 to 1934, the California Crematorium had conducted 23,732 cremations, 53% of which were placed in bronze urns and inurned in the columbarium. of the dead secure forever. 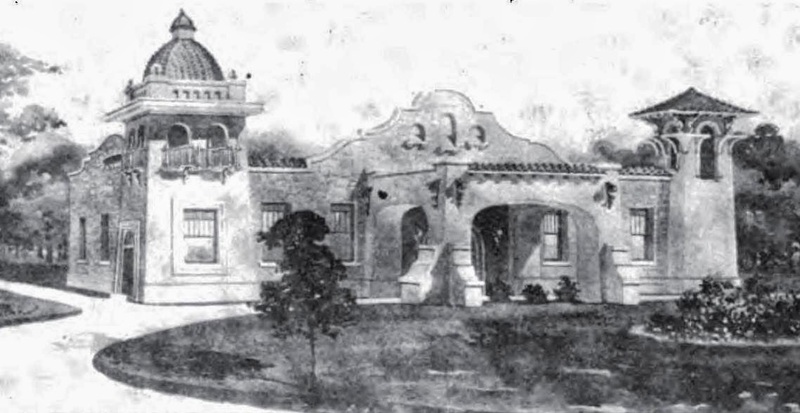 later became the Chapel of the Chimes, in Oakland. 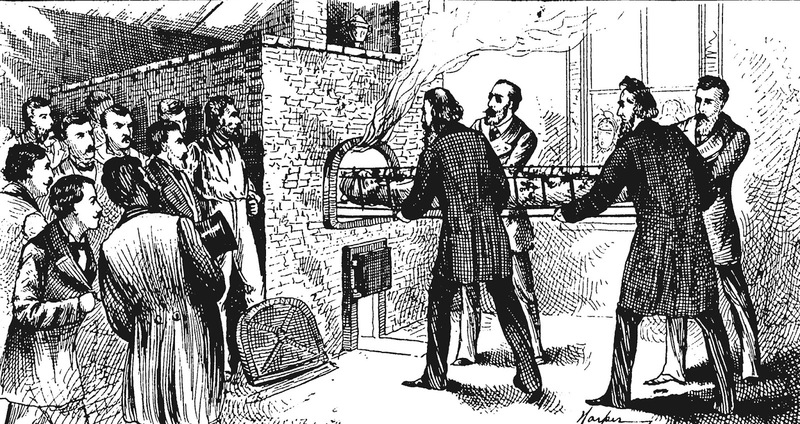 Throughout the meetings of the association, there were frequently discussions of standardizing the practices of the crematories across the country. Many ideas were exchanged on how this could be affected to encompass the cremation customs from the east coast to the west coast and the mix of both in the Midwest. 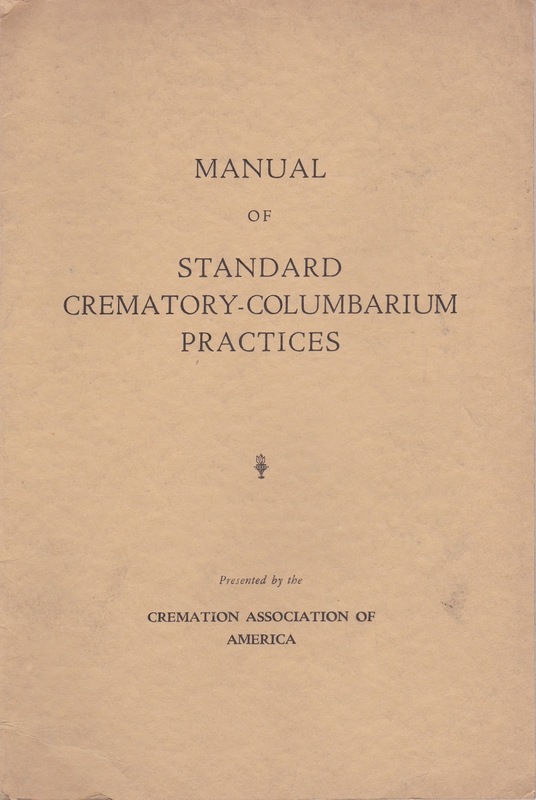 A committee was formed and, after much research, in 1941 the Manual of Standard Crematory and Columbarium Practices, originally published by the Interment Association of Northern California, was adopted. 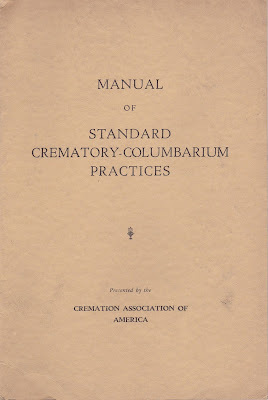 This manual was considered the textbook of the operations of the modern crematory and columbarium, and was the bible by which cremationists promulgated the memorial idea. Throughout the manual, sections dealt with all aspects of operating a crematory and columbarium, but the sections that discussed the handling of cremated remains and the permanent placement of memorial urns were the most doctrinal in nature. 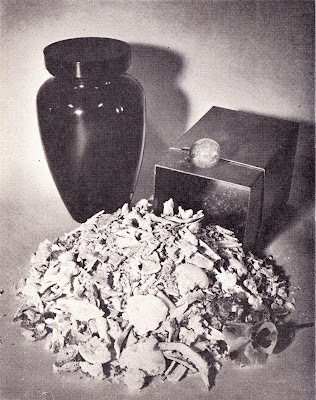 During the memorial idea era of cremation’s history, most cremationists refused to pulverize, crush or grind cremated remains in order to reduce their consistency. Their reasoning was to further the need for a permanent urn and to aide in the prevention of scattering. It was the belief that the reduction of the remains to the finer consistency was a desecration to the remains and gave the impression of valueless ash. “Place Only Urns That Are of Permanent Material in Columbarium Niches. Much of this may seem like heavy cremationist doctrine, but the cremationists were quite successful in their endeavors. This time frame in cremation’s history in America caused some of the most beautiful memorials imaginable to be created, and they remain beautiful to this day. The idea also caused some very successful revenues for the cremationists. The Memorial Idea revealed the heart of the true cremationist in every way. It took cremation from the hands of reform societies and placed it in the gentle care of business men who brought the idea to life. Unfortunately, by the 1970s, a new idea in cremation began to move in. The face of cremation was about to change drastically.